There are countless reasons to make our aluminum alloys your top choice for gasoline and diesel engine pistons: low weight, high thermal conductivity, low costs, high reliability, and many, many more! These characteristics are especially important today because the requirements for pistons have become greater over the past few years; thermal and mechanical loads have risen dramatically as a result of higher power demands. The stresses at average ignition pressures have increased through direct fuel injection and turbocharging, while high speed concepts have led to an increase in inertia load. PAC/Rightway has responded to these requirements by utilizing patented NASA alloy technology along with innovative approaches, offering cutting edge products to meet the challenges of tomorrow. 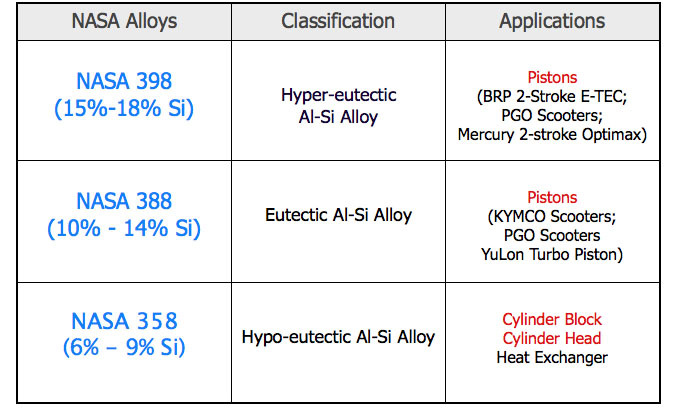 The patented NASA alloys consist of three series: MSFC-398, MSFC-388, and MSFC-358. MSFC-398 is an ideal choice for internal combustion engine applications that need to meet high mechanical and thermal loadings requirements at temperatures from 500°F (260°C) to 730°F (388°C). 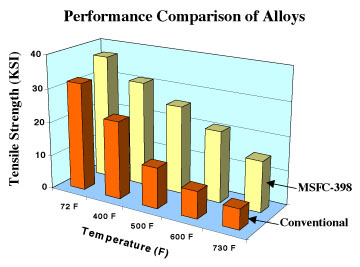 MSFC-398 offers dramatic strength improvement compared to conventional alloys such as the aluminum-silicon hypereutectic 390 and eutectic 332. MSFC-398 is being used as the piston for two-stroke DI engines and four-stroke air-cooled engines. MSFC-388 has similar high-temperature strength and stability characteristics but the lower Si content provides customers with a good choice for applications that demand higher ductility and fracture toughness. One application for MSFC-388 is in piston production for air-cooled motor scooter engines. This alloy is also the best choice for high-performance forged pistons and squeeze cast pistons. With squeeze casting, a fine microstructure can be achieved in the high-stress zones, which further improves fatigue resistance and the resistance to temperature fluctuations. Among these NASA alloys, MSFC-358 has the lowest Si content and is specifically designed for applications that do not demand high-wear resistance and low thermal expansion characteristics. Applications for NASA-358 include cylinder blocks (with Ni composite for wear resistance), cylinder heads, heat exchangers, turbo chargers, etc. Pistons made from NASA patented high strength aluminum alloys can make high-performance engines cleaner and quieter. 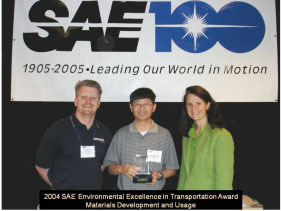 The Society of Automotive Engineers (SAE) honored the NASA/Bombardier Recreational Products (BRP) team with the award for 1st place, Environmental Excellence in Transportation (E2T), in the Materials Development and Usage category. This award recognizes significant innovations in reducing the environmental impact caused by the transportation industry.